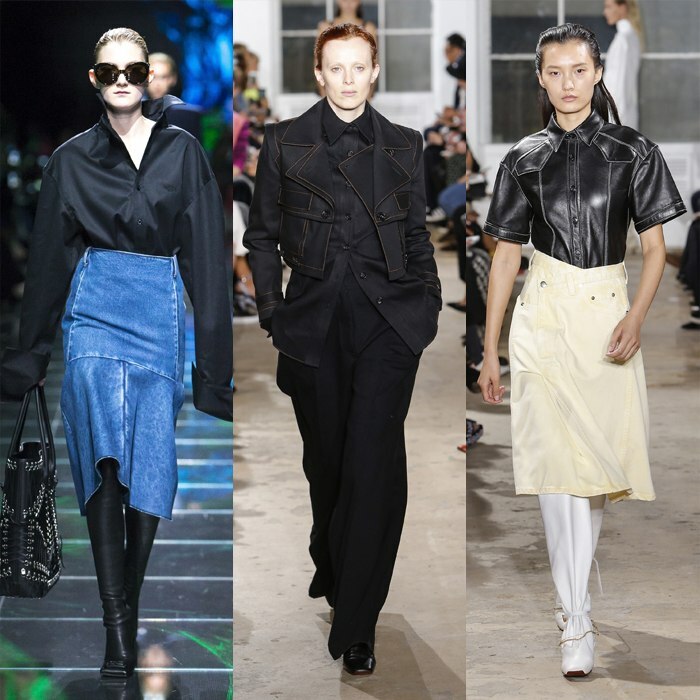 Fashion trends 2019 – should you follow them or not this spring? I love the quote from Oscar de la Renta, who says: “Fashion is about dressing according to what’s fashionable. Style is about being yourself”. His wise words are included in this round-up of quotes about fashion and style. But, that’s not to say that you should completely ignore the trends strutting their way down the designer runways. It is about taking what is on trend and working out which of those trends fit in with your own style, and how you can incorporate them into your existing closet. 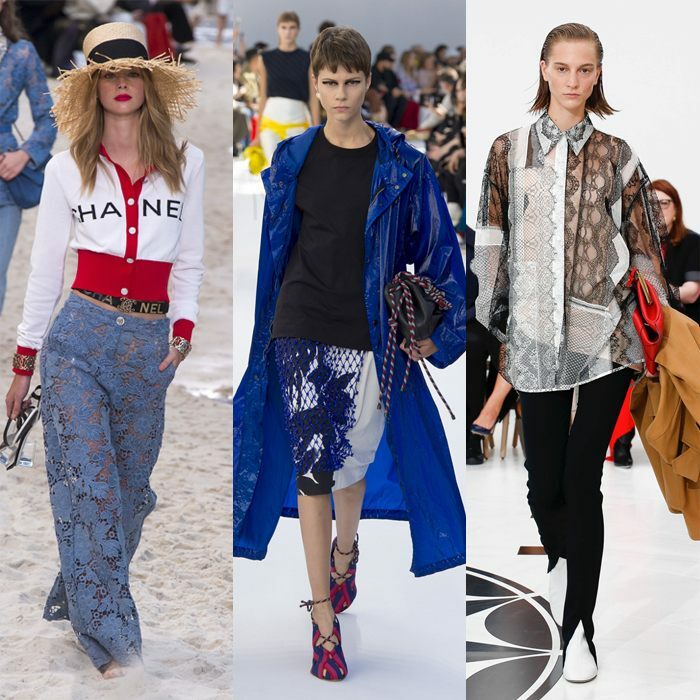 So, what are the trends you should look out for as we head towards spring 2019? Because, it goes without saying that not all trends will suit you and that not all of the fashions showcased are likely to appeal to, or flatter, women over 40. Polka dots are one of those style staples which are always on trend. If you invest in polka dots, you can pretty much guarantee that you’ll still be wearing them for many seasons to come. That’s why I was so pleased to see pretty polka dots on the catwalks for spring. 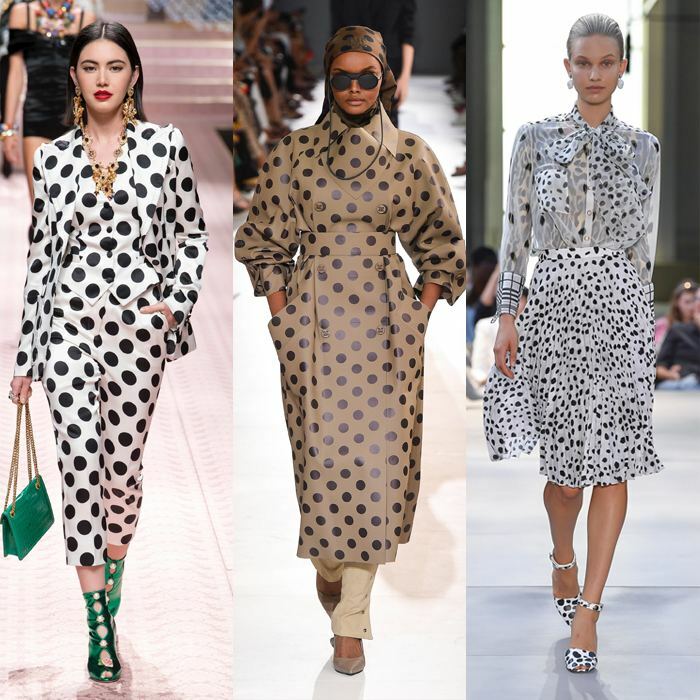 Everyone from Burberry to Carolina Herrara, Dolce & Gabbana to Max Mara decided that dots were their print of choice. For a modern take this Spring, make your dots big or print mix your polka dots. If you’re lucky enough to be heading off on vacation this year, or even if you’re staycationing, then the holiday wear of choice definitely took inspiration from glamorous days gone by. Think Capri or Saint Tropez in the 50s and 70s. 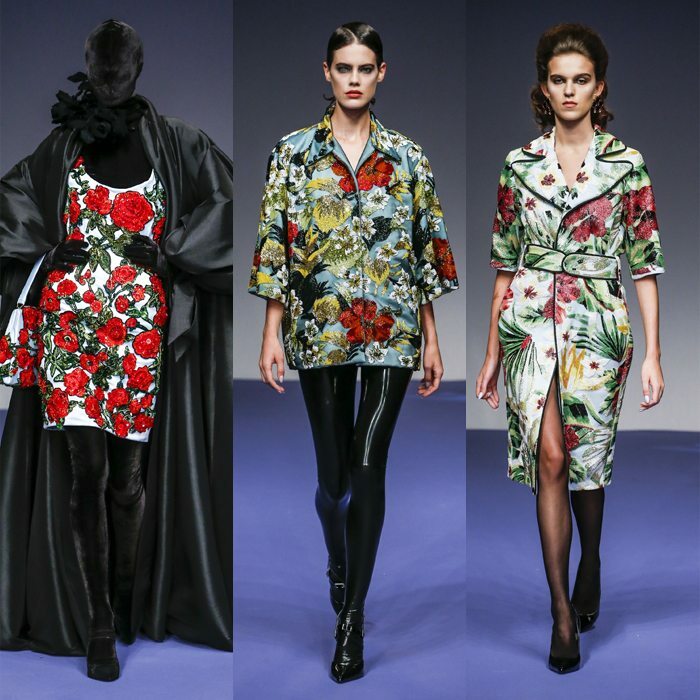 I won’t be bearing my midriff as shown at the Isa Arfen show, but I do love the prints which were on display and the beautiful silhouettes of the skirts. This can be a tricky one to wear, unless you want to look like Pocahontas. But, you don’t have to go full-on if you opt for this trend. A little bit of fringing can go a long way. You could opt for glamorous fringing like that seen on Jacquemus’ party dresses, or go for a more subtle approach such as using fringing on your accessories, like on the ends of your scarves. Fringing has got much more sophisticated this season whereas once it was seen simply as a hippie staple. What is casual and what is formal were once very clearly set out. But, increasingly in recent years, the line between casual and formal wear has definitely become blurred. Part of that is how we wear our winter sweaters. 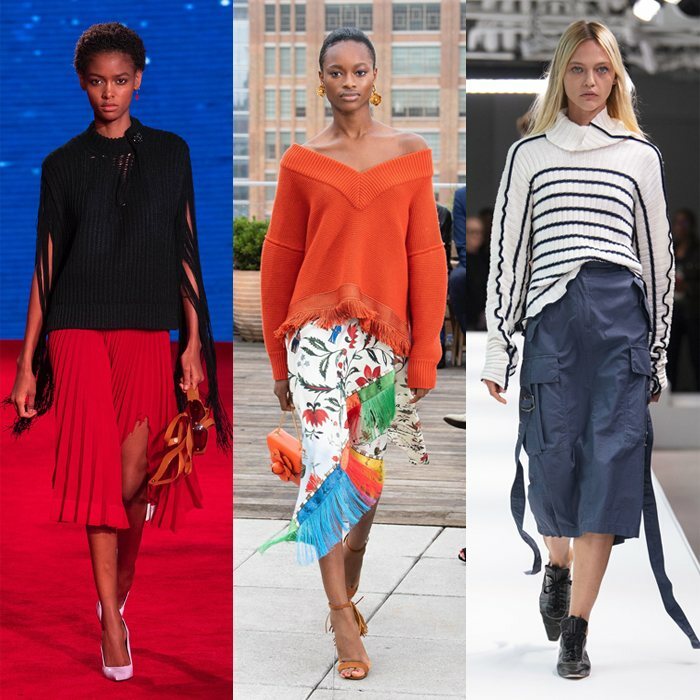 Designers showed how you can wear your summer skirt with a cozy sweater to make an outfit work for transitional seasons. Are you surprised to see animal print again? Or did you expect to see a version on the catwalks? I thought I’d show you this as most of you have animal prints in your closet already. 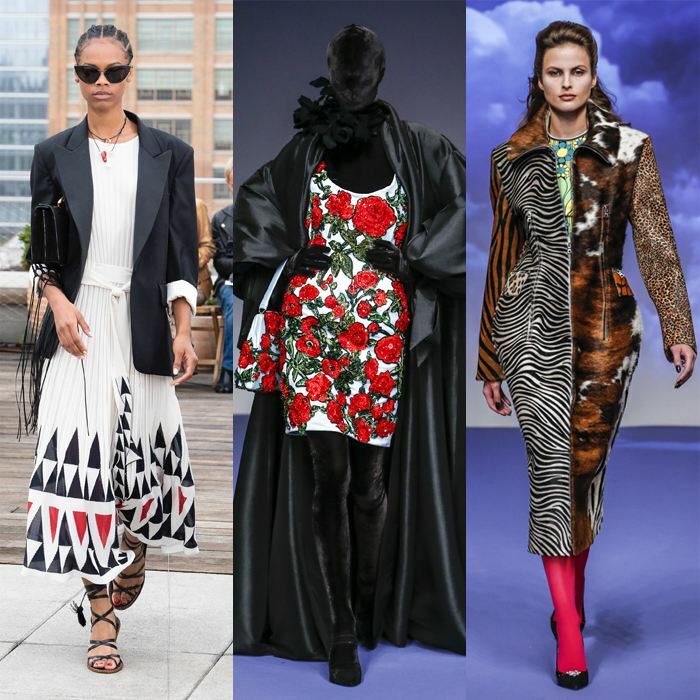 Many designers chose to just use elements of animal print, such as on sleeves or belts, while others went top-to-toe with the look. Burberry chose to print mix with zebra and leopard. I don’t think those two would get on very well together in the wild, but the ladylike silhouette made it work for Burberry. Richard Quinn also decided to mix his animals, with cowhide, leopard, zebra and tiger all vying for space together on the same dress. The stunning couture that you see on the runways is definitely a form of art as far as I’m concerned. It has color, form, design, and structure. And, designers took that a step further by showcasing prints which looked like paintings on their chosen fabrics. The scarf prints that we saw last season, for autumn and winter 2018, were still in evidence, but designers also chose to turn their designs into artworks for spring. 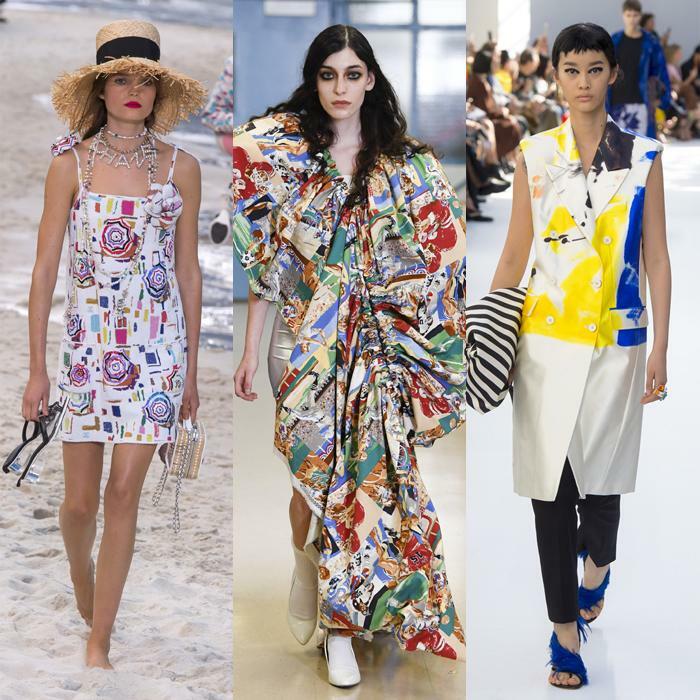 I’m not suggesting that you need to opt for a hemline as short as that on the Chanel runways (although you could always team short skirts with skinny jeans or jeggings), or as voluminous a dress as shown by Vaquera, but you may be inspired by the prints. Lace is a fabric we perhaps wear more for formal occasions than for day-to-day dressing. But lace for the upcoming season had more of an easy-breezy feel. Lace palazzo pants anyone? I’m not suggesting you cover up the rest of you like Richard Quinn did to his models, but it certainly made his dresses stand out! The florals showcased on the catwalk were lovely and could be a great option if you have a summer event, such as a wedding to attend. Or for casual wear, just team a floral blouse with your jeans and sneakers. 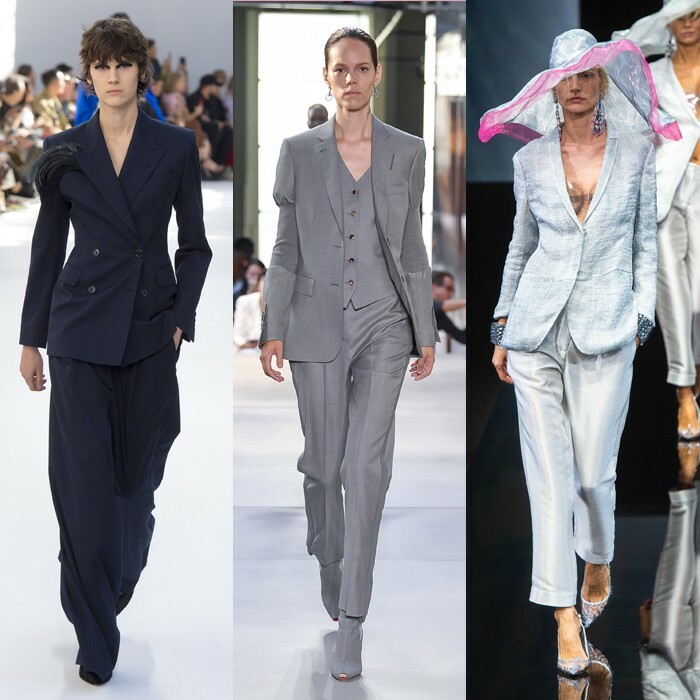 While the two-piece suit, particularly the skirt suit, has fallen out of favor recently because it can look old-fashioned, I loved the streamlined silhouettes seen on the catwalks for SS19. Some designers opted for outlandishly large shoulders, which wouldn’t work in real life if you still want to be able to fit through a door frame! But most shows featured a suit in a neutral or bright shade in a feminine shape. I think these could work beautifully instead of a dress at a formal event. Or, you could add a bit of casual flair to your suit and wear with a t-shirt and some silver sneakers. Stripes are another one of those pattern perennials which never go out of fashion. I think this season it could be nice to look for something a little unusual, such as opting for diagonal stripes, or pattern mixing, rather than the expected horizontal or vertical stripes (although, those are good too!). Dries Van Noten’s collection was definitely my favorite for this spring. I thought the Belgian designer was just so on point with his use of color, the way he styled his stripes and his beautiful art-inspired prints. Although, if Georgio Armani were to hand over his collection, I wouldn’t say no to that either! Or Max Mara! Okay, I’m not usually a fan of pale blue denim as I think it can be unflattering. A darker wash is normally my preference. However, designers decided to go back to the 80s for their choice of denim for SS19. And, if you’re careful about the choices you make, there are some flattering options out there. I particularly liked the shape of Balenciaga’s denim skirt. I also liked Proenza Schouler’s take on denim this season. There were darker hues, including structured jackets, along with paler jean skirts which I could see would work for day-to-day summer dressing. 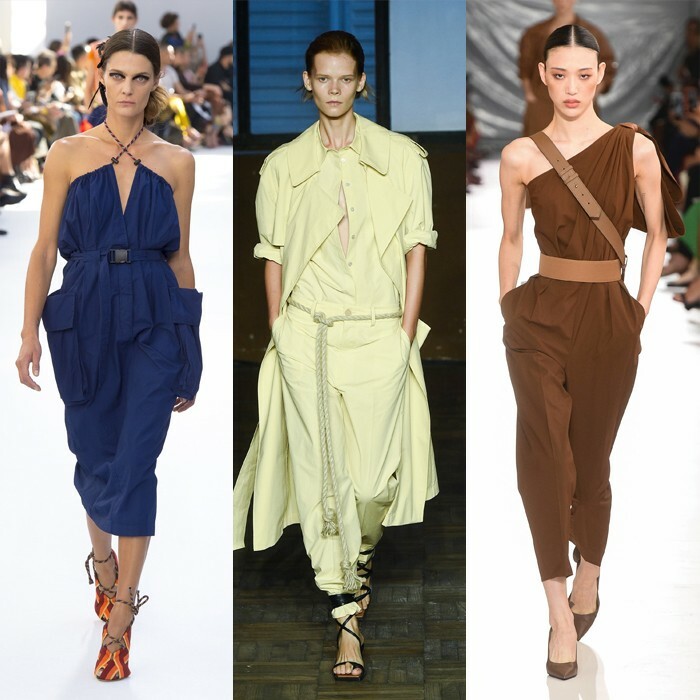 Designers have gone back to the 90s for inspiration for spring. While that may not always be a good thing, there were some beautiful utility options on the runways. I would choose utilitywear in a softly draping fabric, rather than anything too stiff. One of the great things about utilitywear is that you can choose options with pockets or zips in places on your body which are most flattering. So, if you want to create volume on your bottom half, you could add pockets there, for example. While there were some stunning looks on the catwalks for spring, there were also some I will be avoiding. The cycle shorts as daywear look still seems to be everywhere but it’s not for me. I will also be leaving wetsuits for the beach. There were also some very big gowns on the catwalk, but you could always take a small element of the ruffling or volume rather than go as big as the one below. How about you? 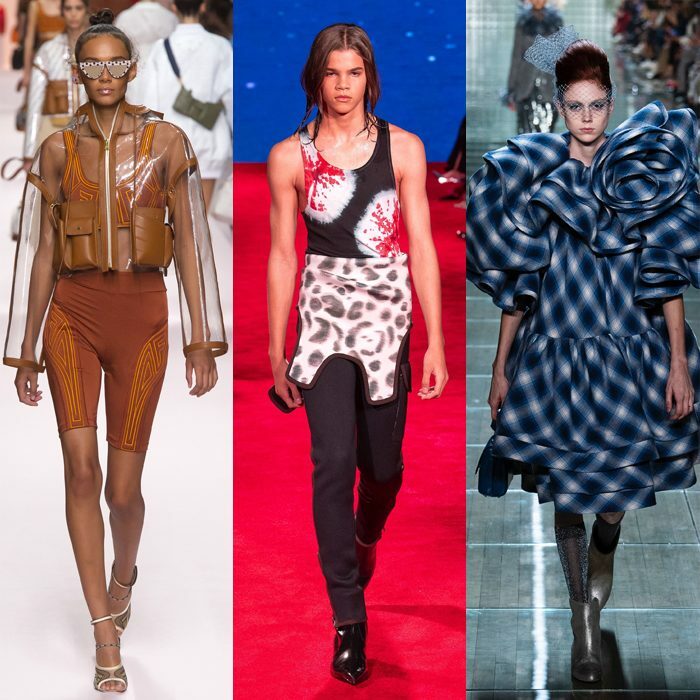 What were your favorite fashion trends 2019? What do you already have in your closet? What are you most looking forward to wearing this Spring? Thanks for this article, it’s a good window into 2019. I especially like the Burberry black and white dress (or blouse and skirt) with the dots and the sheer over opaque top. I also admired the Victoria Beckham lace mixed-media blouse. Not that I’ll be shopping for either one. I just picked up a pair of pants with large polka-dots that I’m excited to wear for Spring. And I have a vintage 1960’s dress of my mother’s that is navy with white Dotted Swiss and has red embroidery down the front and hemline. Every time I wear it people notice. I can see how the Dries Van Noten stripes appeal to your style taste. I would love to wear the first look – the green floral top and black and white striped skirt with the sheer overlay. Great to hear this article is useful to you Julia. Your pants and dress sound wonderful! I’m so excited to see the tailored suit with the vest/waistcoat. Do you have any idea of where I can find a suit with a vest? I’ve been looking, but not having any success. Thank you! I already have many of the trends like florals, polka dots, fringe, animal print and lace in my wardrobe. I love classic styles in interesting fabric textures and prints. The trend I am adding is a modern cut jacket and pant in the same fabric/color. I will wear this to work accessorized for a more casual vibe. And use the pants and jacket as separates in other outfits. 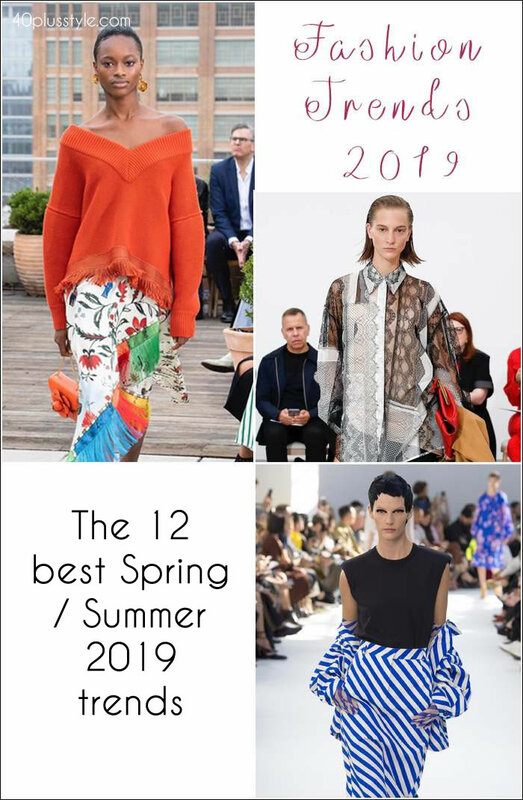 Thanks for summing up 2019 spring/summer…your article was thoughtfully put together and well articulated – more than I can say for many $$$ publications. I enjoy your approach. I tend to be more conservative – but I do love the bright colors (the orange especially) and like the dots – those are things I will look to add to wardrobe this year. 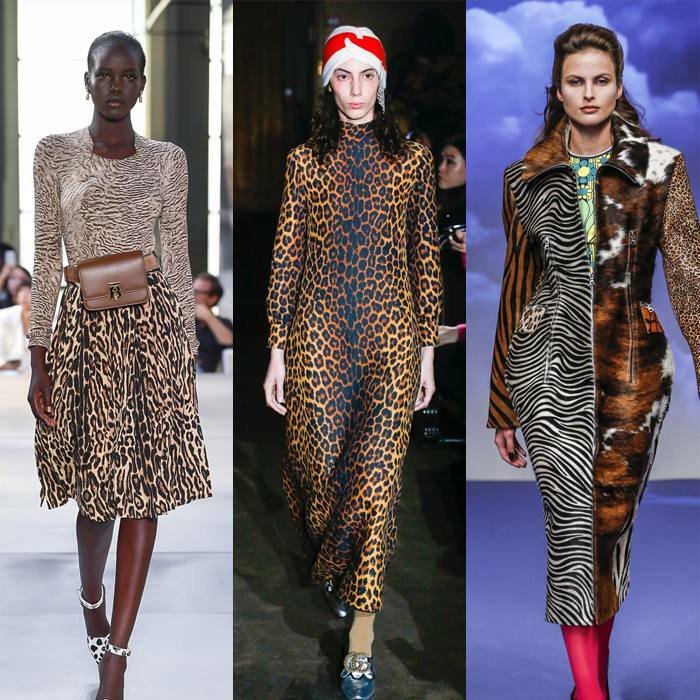 I like animal prints and will continue to wear them (although more conservatively than the runway!). I love the matched suiting look – but this is too “dressed up” for anything I do. Why is it that all runway models look grumpy and/or sad? Wouldn’t people be more (subconsciously) attracted to outfits worn by “happy” people? It’s a mystery to me too. In the 80s the models used to smile, have fun and have normal bodies. I’m not sure why designers think that looking miserable is ‘cool’ and makes their clothes look better. I especially like the idea of “mixed dots”, I’ve never thought of it, but it looks stunning. Many of these are pieces I already own, and this post gives me guidance on how to style them. Thanks! I’m glad to see that I already have a lot of the trends in my closet … florals, polka dots, fringe, animal print and lace. I will look forward to seeing how I can vary the styling. Great article! Thanks for the glimpse of what’s trending this season. 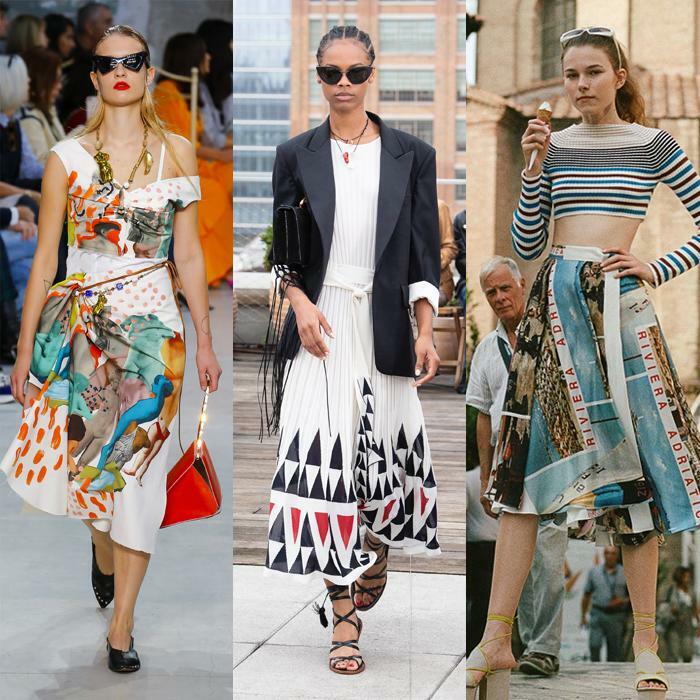 Fun to see the stripes, animal prints and polka dots still being in fashion. Have those in my closet and when I wear them I will know I’m current! The colorful florals look like fun. Think I can find those in there, too! This is a fun article. Thanks.